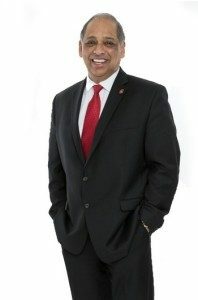 Neville Pinto was appointed by the University of Cincinnati Board of Trustees to serve as the university’s 30th President. He took office on Feb. 20, 2017. Recently, President Pinto served as acting president and professor of chemical engineering at the University of Louisville. He has spent his entire career as a university teacher, researcher and administrator. Prior to joining the University of Louisville, Pinto served for 26 years on the faculty in chemical engineering at the University of Cincinnati, where he established the Adsorption and Ion Exchange Laboratory, which focused on research in biochemical and environmental engineering. His research included purification of genetically engineered drugs, the study of bio-membranes, and air and water purification. His laboratory attracted over $6 million in external research funding and trained 32 graduate students including 16 PhD students, many of whom have moved on to become leaders in industry and academia. Earlier in his career at the University of Cincinnati, Pinto held a number of administrative posts, including Department Head for Chemical Engineering, Assistant Dean for Graduate Studies in the College of Engineering, and, most recently, Vice Provost and Dean of The Graduate School. As Dean, he had a leadership role in attracting major external awards totaling over $10 million to the University of Cincinnati to support graduate and STEM education. Pinto joined the University of Louisville as Dean of the J.B. Speed School of Engineering in 2011. While dean, his accomplishments included overseeing a major expansion in the enrollment of the college and spearheading the development of the Belknap Engineering and Applied Sciences Research Park. He significantly strengthened the university’s relationship with GE, to develop a partnership that has led to significant educational and career opportunities for students and encouraged the company to bring its FirstBuild microfactory to campus. This effort earned the Silver Fleur-de-Lis award from Greater Louisville Inc. in 2015. Between May 2015 and July 2016, Pinto served as Interim Executive Vice President and University Provost at UoL. During this period, he finalized the 21st Century University Plan and launched major initiatives to strengthen educational excellence, student success and access, research and community engagement. He was appointed Acting President in 2016. Pinto was elected Fellow of the Graduate School of the University of Cincinnati based on outstanding scholarly attainment and was elected to the National Academy of Inventors in recognition of U.S. patents awarded. He has variously been active in the American Institute of Chemical Engineers, American Society for Engineering Education, American Chemical Society and is a member of the Tau Beta Pi Engineering Honor Society. He is also the recipient of numerous outstanding teaching and service awards. Pinto was born in Mumbai, India. He was educated at the Indian Institute of Technology, New Delhi, where he earned his bachelor’s degree in chemical engineering. He earned his MS and his PhD in chemical engineering at Penn State University.